Brendan Taylor and Mujeeb Ur Rahman also sanctioned for breaching the ICC Code of Conduct during Tuesday’s high-pressure thriller. 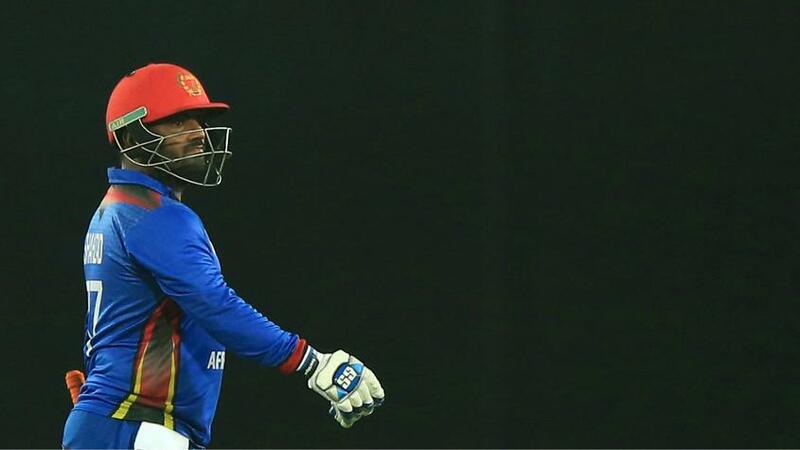 Wicketkeeper-batsman Mohammad Shahzad has been suspended for Afghanistan’s upcoming two matches in the ICC Cricket World Cup Qualifier 2018 after his accumulated demerit points reached four within a 24-month period following his latest breach of the ICC Code of Conduct for which he received a 15 per cent fine and one demerit point*. During a thrilling match against Zimbabwe at the Bulawayo Athletic Club on Tuesday, Shahzad was found guilty of breaching Article 2.1.8, which relates to “abuse of cricket equipment or clothing, ground equipment or fixtures and fittings during an international match”. As Shahzad had been fined 100 per cent of his match fee and handed three demerit points in a Twenty20 International against the United Arab Emirates at the Dubai International Stadium on 12 December 2016, the addition of this one demerit point took him to the threshold of four demerit points, which, pursuant to article 7.6 of the Code, have now been converted into two suspension points**. Consequently, Shahzad will now miss Afghanistan’s matches against Hong Kong and Nepal, which will be played in Bulawayo on 8 and 10 March, respectively. Following this suspension, the four demerit points will remain on Shahzad’s disciplinary record. If he reaches the next threshold of eight or more demerit points within a 24-month period, then they will be converted into four suspension points***. Tuesday’s incident happened when Shahzad, after being caught by Malcolm Waller off Tendai Chatara for 30 in the ninth over, hit his bat hard on the pitch adjacent to the match pitch, which left a significant divot on the turf. Shahzad admitted the offence and accepted the sanction proposed by match referee David Jukes and, as such, there was no need for a formal hearing. 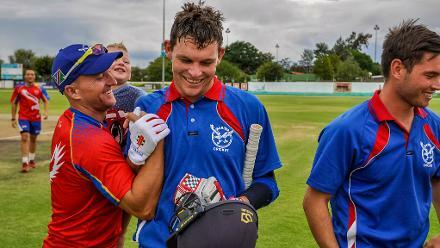 Meanwhile, Brendan Taylor of Zimbabwe and Afghanistan’s 16-year-old Mujeeb Rahman have also been sanctioned for separate incidents during the match. Taylor was found to have breached Article 2.1.5, which deals with “showing dissent at an umpire’s decision during an international match”, while Mujeeb was found guilty of breaching Article 2.2.8, which relates to “throwing a ball (or any other item of cricket equipment such as a water bottle) at or near a Player, Player Support Personnel, Umpire, Match Referee or any other third person in an inappropriate and/or dangerous manner during an international match”. Taylor was fined 15 per cent of his match fee and received one demerit point after pleading guilty to the charge, while Mujeeb was fined 50 per cent of his match fee and got three demerit points following a hearing that took place on Wednesday morning after he had denied the offence and opted to contest the charge at a full hearing. The Afghanistan team management and the match officials attended the hearing, at which he was found guilty by the match referee. The incident involving Taylor happened during the closing stages of the match when the wicketkeeper showed dissent after umpire Chettithody Shamsuddin had turned down a leg before appeal against Dawlat Zadran off the bowling of Blessing Muzarabani. Mujeeb was charged and subsequently fined when, after fielding off his own bowling, the off-spinner threw the ball back at the batsman who had not left his crease. The on-field umpires deemed the throwing “in a dangerous manner” as it narrowly missed Brendan Taylor. The charges were laid by on-field umpires Chris Brown and Chettithody Shamsuddin and third umpire Paul Wilson. In another match, Nizakat Khan of Hong Kong has received a 50 per cent fine of his match fee and three demerit points for a violating Article 2.2.7, which deals with “inappropriate and deliberate physical contact with a Player, Player Support Personnel or any other Person (including a spectator) in the course of play during an international match”. The incident happened on the last ball of the 10th over when Nizakat, while taking a run, made an inappropriate and deliberate physical contact by using his shoulder against Scotland bowler Alasdair Evans. Nizakat admitted the offence after the match and accepted the sanction proposed by match referee Shaid Wadvalla and, as such, there was no need for a formal hearing. The charge was laid by on-field umpires Joel Wilson and Adrian Holdstock and third umpire Gregory Brathwaite. All level 1 breaches carry a minimum penalty of an official reprimand, a maximum penalty of 50 per cent of a player’s match fee, and one or two demerit points, while level 2 breaches carry an imposition of a fine between 50 per cent to 100 per cent of the applicable match fee and/or up to two suspension points, and three or four demerit points. *** Four suspension points equate to a ban from two Tests or four ODIs or four T20Is, whatever comes first for the player.